‘Sweet Intoxication’ is an attractive lilac Floribunda rose bred by renowned Hybridiser Dr. Keith W. Zary in the USA in 2008, using the Gold Medal winning rose ‘Perfume Perfection’ as one of the parent plants and Melody Parfumée ™. This rose was introduced in the United States by Jackson and Perkins in 2010 as ‘Sweet Intoxication’ and in Australia by Swane’s Nurseries in 2012. ‘Sweet Intoxication’ produces rich magenta blooms with a deeper colour in the centre, fading to lavender on the reverse side of the petals. This sweetly scented rose has an alluring, spicy clove fragrance – hence its name. The bush is tall and upright growing to 1.35m to 1.5m with healthy, glossy medium green foliage. A versatile rose, ideal for garden beds, mixed borders, flowering hedge or use as a cut flower as the blooms are medium to large (average 10 cm diameter and 26-40 petals) formed in clusters of 6 to 10 per stem and have a long vase life. It is also suitable to grow in a large tub or patio container e.g. 60cm pot and it is great as a standard rose. 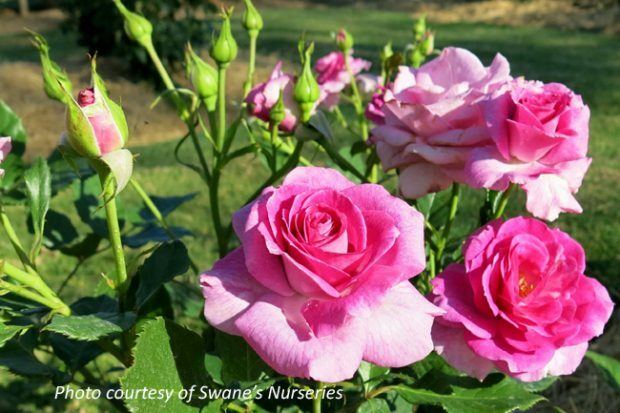 Available from Swane’s Nurseries (NSW), Treloar Roses (Victoria) or order from your local garden centre.